The holidays are coming up and I know many of you would like to redecorate before having friends and family over. Of course this is easier said than done, especially during a recession. Even if you have the money you may be reluctant to part with it. We think we have a solution that will allow you to dramatically alter the look of your dining and parsons chairs without costing you a fortune. What am I talking about? Slipcovers. We have added five new slipcover styles to our line and there are more to come. At the very least, a slipcover allows you to change the look of a chair by permitting you to change the fabric without going to the expense of buying an entirely new chair. 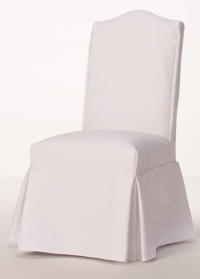 Slipcovers can also dramatically change the look of a chair. For example you might go from unskirted to skirted. You may want to have one color on your chairs for fall and winter and then take the slipcover off for spring and summer. A slipcover offers a lot of flexibility and since they are relatively affordable, you can get multiple sets to change the look as often as you like. Slipcovers may not be for everyone. 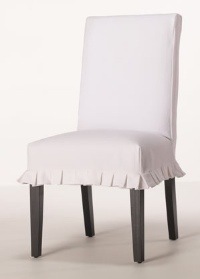 Although they are tailored to the chairs we offer, you won't get the crisp look of an upholstered chair. However, I have to admit they can really come in handy. My family uses slipcovers in our breakfast room. With two cats and two children they are more of a shield than anything else. If we get food or cat hair on them, we can just take them off for a cleaning. And when company comes, we take off the slipcovers and have pristine chairs to display for those special occasions.